OK, now I've found an interesting story in the paper. Apparently there is a stalker bunny roaming the streets! 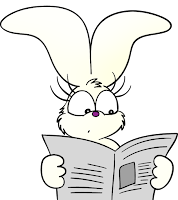 The article says that this bunny has broken into somebody's home and stolen a book! It also says that this bunny is female, about my height with eyelashes and a purple nose. The police are looking out for this stalker. I hope they find her soon. Who could that be at the door?